You can tell how much I love a Quentin Tarantino film by the size of the smile plastered across my face throughout. When the man is at the top of his game in regards to inventive set pieces, bold ideas and ingeniously clever dialogue, I can't stop grinning. Even though the end results are grotesque, the moment during Reservoir Dogs when Mr. Blonde turns on K-Billy's Super Sounds of the 70's and "Stuck in the Middle with You" comes blasting out of the speakers, I am filled with glee. Pulp Fiction is an absolute masterpiece of cinema and pretty much every scene is perfect, but I can't go a week without randomly saying "Zed's dead baby, Zed's dead.". The opening scene of Inglourious Basterds is so insanely incredible, a masterclass of building tension through dialogue and performance art, and the basement bar sequence is executed so wonderfully it is difficult to believe. Quentin Tarantino. So many great films. So many smiles. With the release of his 8th feature, appropriately titled The Hateful Eight, I had no idea what to expect. I had caught wind of the good, as many people had labeled it yet another masterpiece. Then there was the bad, those who find his act tired and frankly can't understand the praise that gets tossed in his direction. Finally, the ugly, as quite a few people including a friend of mine literally booed the screen after the final frame disappeared. I love work that polarizes because the opportunity to walk into a theater knowing the rather thin line between admiration and abhorrence is in play. What side would I fall on? Strangely, I am disappointed to say....neither. 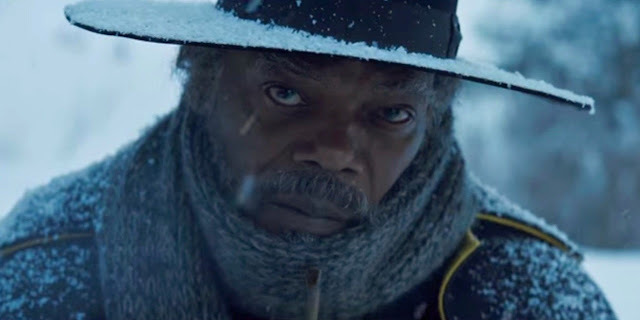 The Hateful Eight is neither a masterpiece nor is it a shameful failure. The performances are on point for a Tarantino script, delivering lines with the darkly comedic timing and enthusiasm necessary to make the song of his desired tone sing. The score by the legendary Ennio Morricone is wonderful and fits the deliciously sinister vibe of the picture like a glove, but I found myself troubled by how seemingly underused it was as such long stretches of the movie are carried only by dialogue and nothing else. The cinematography is gorgeous during the outdoor sequences, but I can't be the only person who finds it odd that a film advertised to be seen on the biggest screen imaginable ends up playing far more like a stage play than a spectacle as a vast majority takes place inside a single location. The scope of the picture managed to feel occasionally huge but far more often limited, and as much as I did eat up the concept of a disturbing and claustrophobic game of whodunit I guess I just hoped for a bit more. The part that troubles me more than anything in the end is that I really wasn't smiling very often during The Hateful Eight. Nor was I cringing. I was just watching and in the end I have trouble believing that much of what I saw will stick long term. 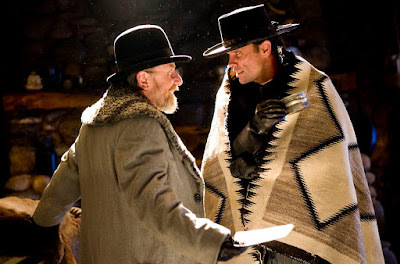 The dialogue featured the unique to Tarantino wit, but none of it felt like it was destined to be iconic like the stuff he used to write. The violence is as gruesome and brutal as advertised but all of the death sort of felt worthy of a shrug of the shoulders rather than any sort of big reaction one way or the other. Heads exploding and blood vomiting and bullets shredding through bodies and yet my reaction to everything I was seeing was pretty much ho hum. I know I am painting a pretty grim picture but the truth is, The Hateful Eight is a good film. It just isn't a great one. The performance of Walton Goggins is inspired, and if that name means nothing to you then that means you didn't watch the fantastic television series Justified and you should change that. Goggins often times stole the show on that program and he without does again here. If he opened his mouth, whatever he said was probably my favorite piece of that moments puzzle. A big twist moment that takes place later in the film is really well done and adds, ahem, another layer to the story, but I wasn't nearly as impressed as I should have been because I kept thinking about how Tarantino pulled the exact same move during that essential first 20 minutes of Basterds as well, only even better then. That's just it really. 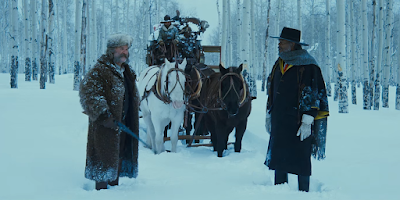 Had The Hateful Eight been one of the first few films ever released by Tarantino I would probably be over the moon about it, but at this point perhaps his style is just started to show a bit of wear and tear with my sensibilities. Even when this movie was at it's best, I felt like I had already seen something similar and my mind would wander to those works rather than stay focused to the new tale he is telling. No ears cut off, no Vincent and Jules banter and nothing close to Shosanna's jewish vengeance. 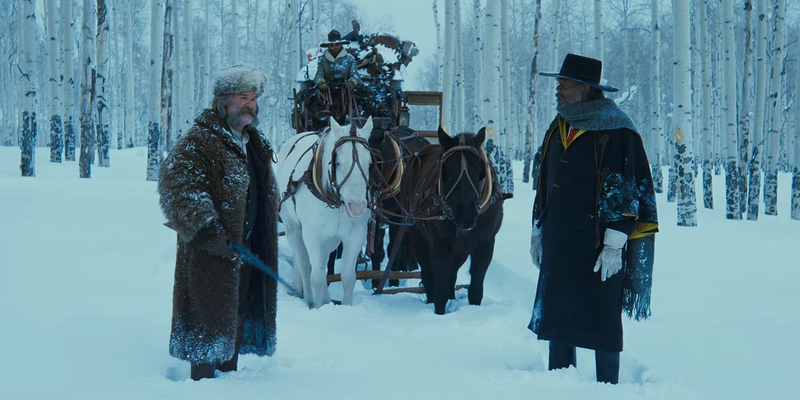 The Hateful Eight is a good film that feels destined to live in the shadows of greatness. I completely agree with you. I have only seen the first half of Pulp fiction and this film, so I can't exactly say I'm a Tarantino fan or compare this to his other works, but from how everybody praises him I was expecting something better than what I got in the Hateful Eight. Just like you said I found it to be okay/good. I didn't think it was bad, but I didn't think it was great either. My favorite characters were Tim Roth and Channing Tatum's characters. They just ate up the scenes for me and that was the only time I really had a smile on my face. Everyone else felt like they were just playing a character, whereas those two felt like they came alive through the screen. Maybe it's because they just had so much damn charisma about them. Anywho, I felt that this film could have easily been shorter. As a side note, while I don't mind excessive gore, I just didn't think it fit with the tone of the film. It was almost comical actually, and when the film was mostly serious and a western I just didn't think that much blood was necessary for the genre. Lastly, you've been doing some remodeling I see! Very different, but I think I'll get used to it. As someone who hasn't really jumped into the Tarantino bandwagon where would you suggest I start in his filmography? Yep, couldn't agree more Cody. With pretty much everything you said. While I don't mind a longer, more epic feeling film, the problem with this film is that it didn't really "feel" epic besides the fact that it was really long, and it certainly could have been paced a little bit to trim just a bit of fat. Also agree with the gore. This is a better film with the same deaths but done with less gruesome imagery. I know Tarantino goes for the hybrid genres and I actually think the gore fits with Inglourious Basterds because that film is supposed to be a fairy tale soaked in realism essentially, a what if World War II would have went this way story, and the violence in that film sort of felt...appropriate given how satisfying it is to watch the Jews get their bloody revenge. Here, it is a darkly comedic film but far more serious then some of his other work and like you said, it wasn't necessary if his goal was to make a Western genre film. Yep, a bit of remodeling. I felt like the old layout made it easy for someone to come check out the first review offered and if it didn't appeal to them, they could easily leave immediately where as this presents more options at first glance. You could start at the very beginning with Reservoir Dogs, but my personal favorites of his are Pulp Fiction and Inglourious Basterds. For me, those are his masterpieces and now that you have seen The Hateful Eight both should be accessible for you knowing his style.